If you haven't done so, find your original email with the purchase link. Go to this page: https://itch.io/docs/buying/already-bought and you can request a FRESH DOWNLOAD EMAIL be sent to you! 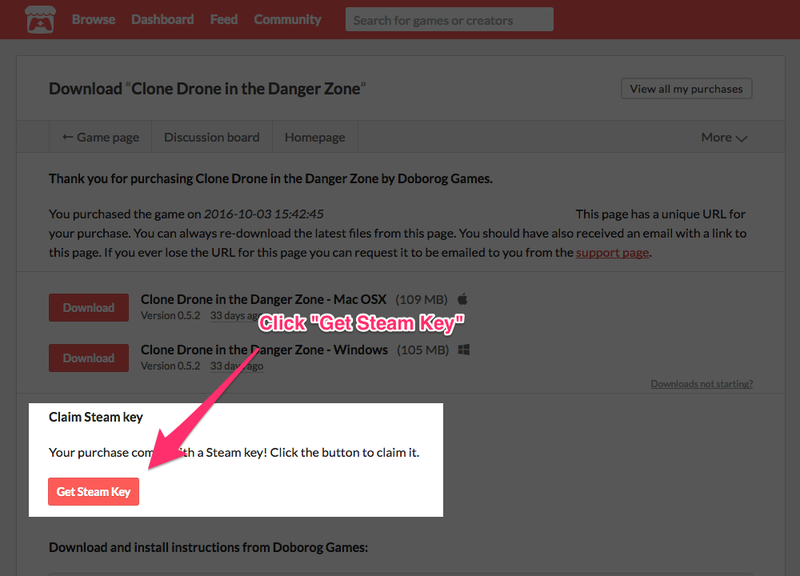 Click the "Get Steam Key" button shown above. Follow the instructions to link your Steam account, verify your email if necessary and then copy the key to your clipboard. 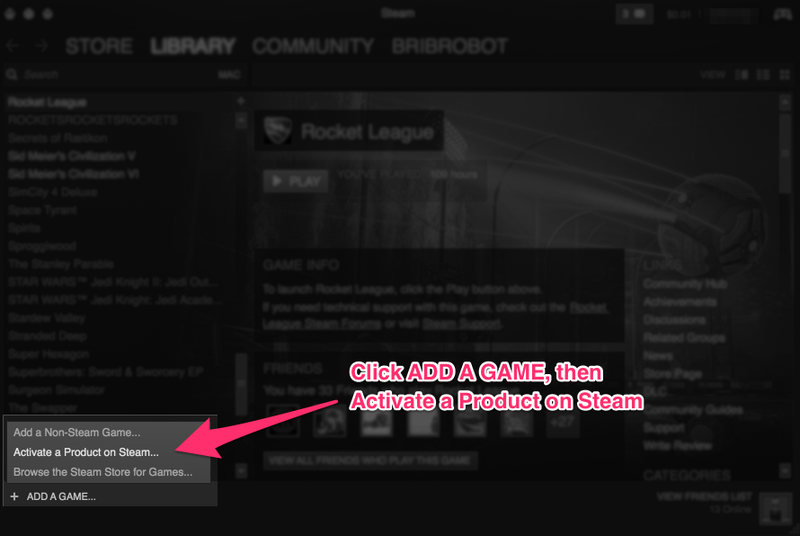 When in doubt, click Get Steam Key again and follow the instructions on screen. 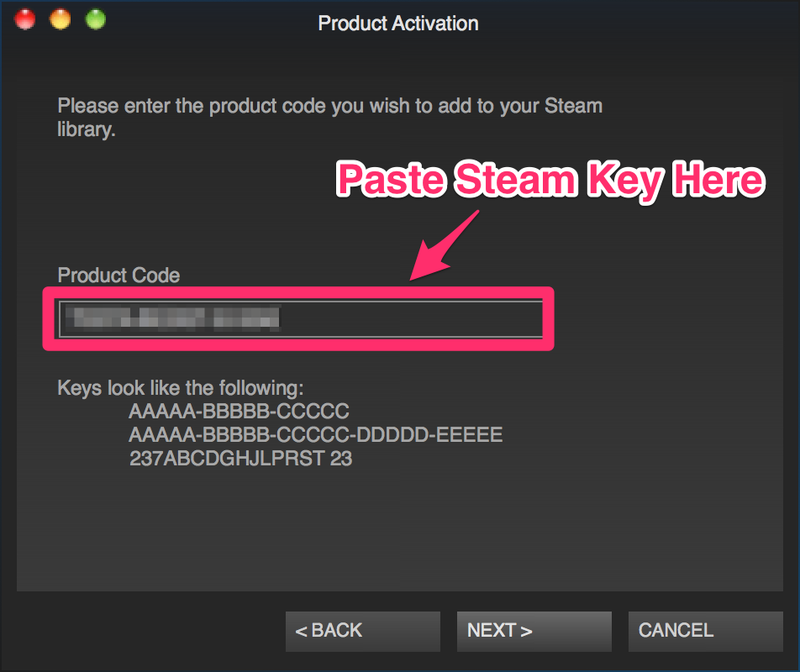 You will use that key to put the game in your Steam library, so copy it to your clipboard. If you'd like, you can link your Steam key to Steam early so on 3/16 all you have to do is install and run it. Follow the steps on-screen. Once you get to this screen, paste in the Steam Key you got from step 2. Once the key is activated, the game will show up in your library and start downloading. Step 4 - Install and Play on Steam! You can now download, install and play the game from your Steam library! Not covered? Reply to this thread and explain where it went wrong. Screenshots are welcome! Still really, really stuck? Contact support (at) doborog.com if you're still stumped and we will help you. Troubleshooting: I didn't create an itch.io account when I bought the game! Troubleshooting: When I open the link to get my Steam key itch displays a 404 error. This will happen if you open the link in a browser that is not logged in to your itch account. Ensure you're logged in to itch and try again. I had a 404 error as well. How did you get the steam key? This is awesome!! can't wait to play it using steam! I had to leave for some time because I have major exams coming up. I'm extremely happy for you guys for making it to steam. If any game deserves it, it's clone drone in the danger zone. Catching up with all the new stuff is probably going to be tough, but I'm looking forward to it. Thanks, hope you have fun! I don't see a redeem steam key option on the page for my downloads, is there a way to fix this? Hey corey, can you please email me support@doborog.com from the email you purchased the game from and I'll investigate? It appears my review copy did not initially come with a steam copy, but thanks to Erik being generous he provided me one, sorry for the misunderstanding, and thank you for this wonderful game. Thanks for following up, have fun! I can't find the key I need to copy and paste. Is it possible to give that key to someone else if i didn't activate it yet ? Nope, it's just for you! If you're having any trouble email me support@doborog.com! hello, i cant get the steam key cuz i make a mistake in the purchase email adress, i can play on itch but i would play the steamworkshop content. What i can do ? Email me support@doborog.com and we'll figure out what's going on! I saw this too. I suppose not all games support it? Perhaps check the game's FAQ for mention of Steam - they might have chosen not to be on Steam. i attempted claiming the steam code so it will get sent onto my email, but the problem is i am using a new email and it wont send it to my new email so i cant get the steam key at all and i attempted changing my email to my current one many times and it still wont work. Hey gorobod -- did you ever sort this out? If not, email me support@doborog.com and let's sort it out! Hey Joey - did you ever figure this out? Email me support@doborog.com and I can help sort it out for you! I don't see nothing for me of get steam key? I bought Snow Daze The Music of Winter Special Edition 187 days ago, am I still able to get something or no? 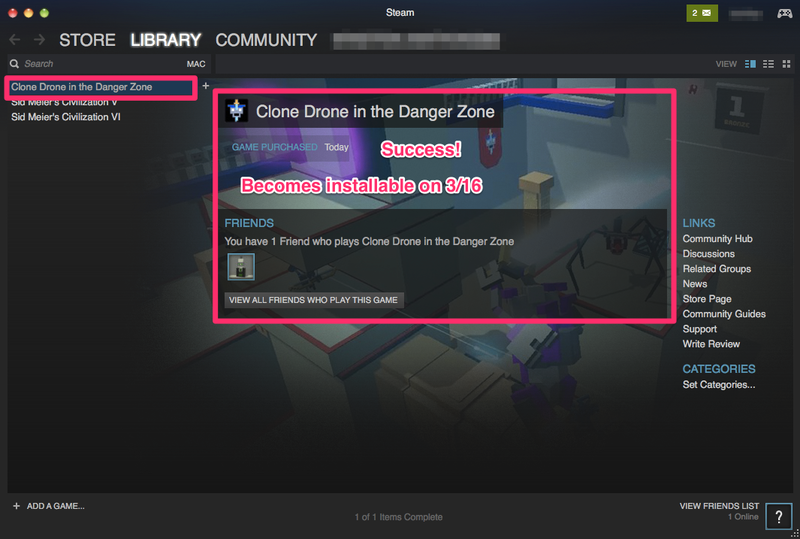 Sounds like you are looking for a different game, I wrote up this guide for Clone Drone in the Danger Zone itch / Steam keys in particular. I'd contact the developer of the game you purchased, they should be able to help you out!